 For my first Xena convention, this certainly was a very good one to start with. I will never forget it. I could talk about the guests, the videos, and the little frustrations of general admission seating but for me there was so much more to the weekend than the con itself. I have been a fan of the show since midway through the third season. Since THE BITTER SUITE (58/312) to be exact. I had no friends with any interest in the show other to laugh and make fun of it. Therefore, for a long time I shared my obsession with no one. In my desire to experience all that there was in relation to the show, I went online and discovered all things Xena. I drank it all in. I joined mailing lists and a newsgroup, but mainly as a lurker. I read fan fiction and hunted for every little spoiler about the upcoming episodes. Yet, I had no one to share this part of my life with. How does this relate to the con? I had become good online friends with a couple of people who at the first mention of the convention had decided to go. With their encouragement, I bought myself general admission tickets for the weekend and then for months proceeded to try to find someone to come with me. I had no luck and by this time one of my online friends had something come up so she would not be able to attend the convention. As the time got closer, I began to question if I would be able to attend the convention, essentially, on my own. I had always been a very shy person and had not traveled much, so, for me, a trip from my relatively small city in Canada to California on my own, seemed to be a rather large leap out of my comfort zone into the unknown. Merwolf Pack to the Rescue! With the continued encouragement of my online friends, I began to respond to roommate requests on the Merwolf Pack mailing list. After a few responses where somebody else had already beaten me to the punch, one of the requestors kindly emailed me one day with the name and email address of someone else who had responded to her. I sent off a message, explaining who I was, where I had gotten her email address, and why I was emailing her. The next thing I knew, I had a roommate and I was not going to be able to back out now. The requisite planning continued, emails were exchanged regularly, both in an attempt to finalize our arrangements, and to try to get to know each other just a little before we were to share a room for four nights. We eventually decided to extend our stay an extra two nights in order to see some of California. Finally, I had more than just a roommate: I had a Xenite traveling companion. We had purchased Exposure brunch tickets (which unfortunately ended up not being used), tickets for the Merpups day at Disneyland, and Bards Brunch tickets. We were now all set. As the trip loomed just days away, my fears, and concerns grew that maybe this was more than I could do on my own. Yes, I had a roommate; and yes I had one friend who I knew I would meet. But it was still a big deal for me. 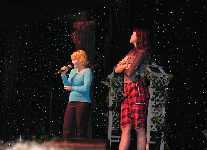 It was a graduation gift to myself, a chance to meet my British online friend, my first con, and getting to see Lucy Lawless and Renee O'Connor on stage. Yet, I had no idea what to expect from any of it. I landed at LAX on time, nervous that I might not recognize my roommate from the one picture that I had seen or that we would not get along. However, two minutes after disembarking the plane, my roommate and I were talking and laughing and heading off to our first Xena convention. Guess who everyone came for! The convention itself was good, I enjoyed seeing the guests, especially Lucy Lawless and Renee O'Connor, of course, but it was mainly the supplemental events and experiences that made the trip what it was for me. It has taken me days to get used to being home again. I miss California, I really did not want to come home, at least, not yet. What began as this fear-laden journey, ended with so many great memories of the people I met and things I did. That is what struck me the most about the convention, and on this trip in general: the people. 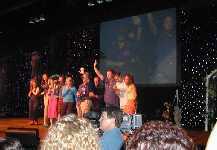 Everyone around you at the convention was there for one main reason, his or her love of the show. Just knowing that and sitting there with all of those people around me, was amazing. However, as we sat there, you could turn to the person next to you and just talk to them. Everyone was so nice. For the first time, I was with a group of people who certainly did not laugh at the mention of the show. They understood it, they understood what brought us all there and what the show was all about. It was so nice and refreshing to be a part of that. Someone on the Merwolf pack mailing list said before the con something to the effect that "pups are a safe-zone". Every pup that I met certainly reinforced that. People walking by in a pup badge could just pop-up unexpectedly, nod their head, or say hi. At Disneyland I had a few moments alone with one of the seven other pups who I ended up spending the day with and she asked me how my roommate and I met. I explained about meeting through the list and I shared how impressed I was that we had gotten along so well after not knowing each other at all. She looked at me and said, "That's how we all are". Certainly after this trip, I believe that. It was depressing coming back to people, who although they genuinely wanted to hear about my trip, they really did not get why I went. Some laughed and some did not, but it was frustrating because even when I tried to explain, they still did not get it. But, I have come to realize that it is okay. I have seen first hand that I am not crazy because I love this show. There are so many people out there who love it too, just as much and more. I do not care if people know it because it is now a part of me. Also, I now know there will always be someone else out there who understands that. For me, the convention was a great deal more than actors and guests related to the show coming out on stage and answering silly questions. It was the brunches, the organized get-togethers, the impromptu meals and walks, and getting to know the people sitting next to you. It was meeting people whose names you recognize from their posts on a mailing list or their fan fiction stories. It was sitting by a pool and talking, getting to hug someone who I had been emailing and chatting with exactly one year and 4 days after we first met, and laughing until your stomach hurt and tears were trickling down your legs (thanks for that one Joey, you do have a way with words). It was exchanging email addresses with new friends, sitting by the ocean watching the waves, and most of all, feeling like you belong to something that other people understand too. It was a great experience, and I would go back in a heartbeat. Though, next time, I would spring for the gold seating. Those hard seats way in the back where you can barely see and hear what is going on up on stage really leave something to be desired. I want to thank those people who made this the great experience that it was. The seven pups from Disneyland who I howled and laughed right along with on those rides, the people we sat with at the bards brunch, those who we went to dinner with, and the people around us that we talked to at the convention. To my little English friend Jo and her friend Richard, I am so glad I finally had the chance to meet you. In addition, most of all, my roommate, Sandy. I feel lucky that things turned out the way they did and I was able to spend those six days with you. I am a 29 year old computer programmer from Ontario, Canada.